The costs associated with thermal imaging systems have restricted their usage and kept it out of reach of the average consumer / impulse-buy territory. However, there have been some recent advancements in this field that have made the prices of such system more palatable to the non-professional users. Thanks to the advent of smart mobile devices, the costs associated with the storage, control and user-interface for these systems could be taken out for most markets. One of the first forays into this space was the $250 FLIR ONE personal thermal imager from FLIR Systems. Unfortunately, by restricting the hardware design to work only with the Apple iPhone 5 and 5s, they lost out on widespread market appeal. Seek Thermal entered the market with a splash by launching their first smartphone-attached infrared camera for just $199. Two distinct models carrying the same features and capabilities were launched, only differing in the connector - one with a microUSB interface for Android devices and another with a Lightning connector for iOS devices. Before talking in detail about the Android version of the camera and the associated mobile app, let us take a moment to understand how thermal imaging works - particularly since this is not something we have covered on our site before. All materials emit infrared energy and the intensity is a function of its temperature. In simple terms, the higher the temperature, the greater the intensity. Thermal imaging systems utilize a sensor to convert the emitted infrared energy into electrical impulses for further processing. In general, these sensors are called bolometers - they are made of materials whose electrical resistance is dependent on the temperature. The heating is triggered by the power of the incident electromagnetic radiation. Note that bolometers can be used for any type of electromagnetic radiation, though they are typically best suited for infrared and microwave frequencies. A microbolometer is a particular type of bolometer suitable for infrared wavelengths, making them suitable for use in thermal imaging systems. The microbolometer in the Seek Thermal camera responds to long-wave infrared (i.e, wavelengths between 7.2 and 13 microns). A microbolometer consists of an array of pixels. The Seek Thermal camera has a 206 x 156 array (for around 32K thermal pixels). Each pixel has multiple layers, as shown in the cross-sectional diagram below. Depending on the manufacturer, the manufacturing procedure and absorbing materials can differ. Amorphous silicon and vanadium oxide (VO) are the two commonly used infrared radiation detecting materials. Despite being lower in performance and longevity compared to amorphous Si, VO is preferred as it has been around for quite some time (more mature) compared to a-Si. The Seek Thermal camera also uses VO as the IR radiation detecting material. The pixel array in the microbolometer is usually encapsulated in a vacuum to increase the life of the device. The construction of the microbolometer also determines the supported temperature range. The Seek Thermal camera can detect temperatures between -40 C and +330 C.
As one of the graphs in the a-Si link above shows, we have also seen a decrease in the dimensions of the individual pixels. While older devices had a pixel pitch of 45 um, newer devices such as the Seek Thermal have a pixel pitch of just 12 um. 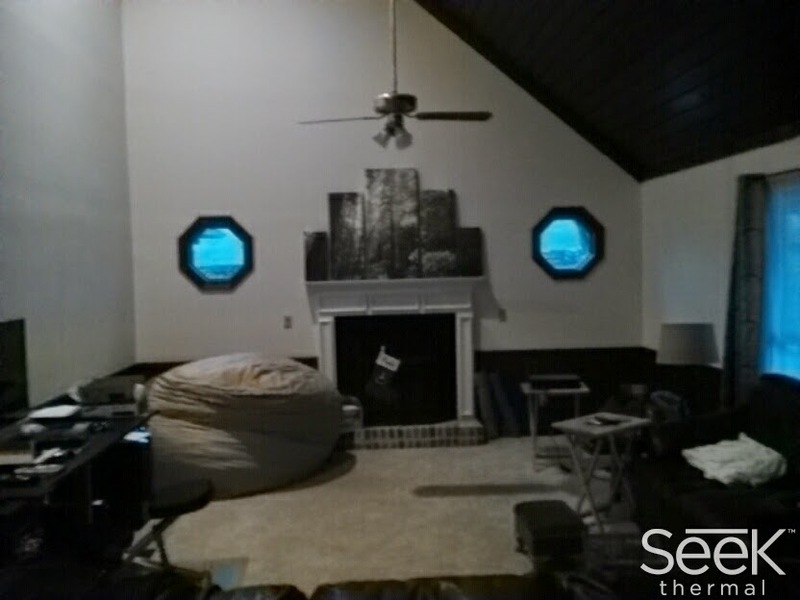 With decreasing pixel size, the number of pixels per unit area increases to provide higher resolution images. Unlike regular cameras (which use regular glass or plastic lenses), thermal cameras can't use materials that reflect thermal radiation. The commonly used materials for thermal lenses are germanium, zinc selenide, zinc sulphide and chalcogenide glass - all of these have good transmission capabilities for the infrared wavelengths. 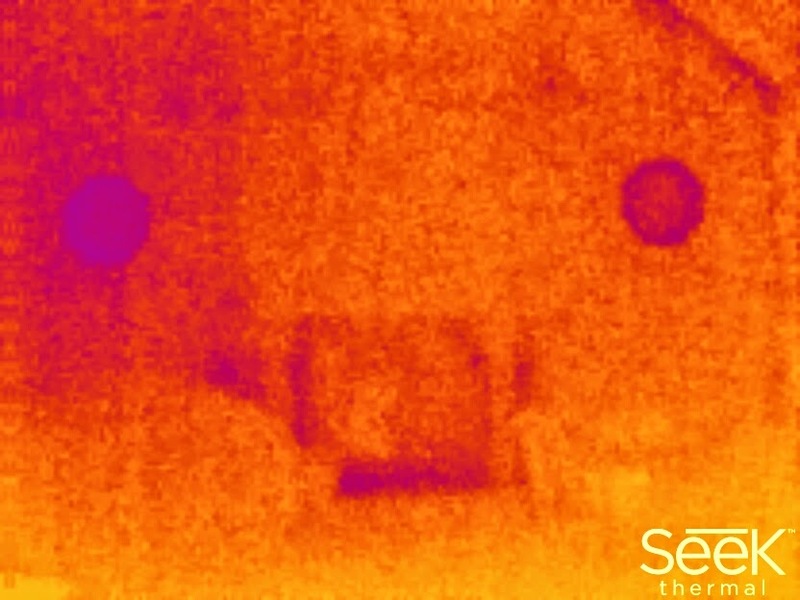 The Seek Thermal camera uses a chalcogenide lens (a type of glass containing one or more of sulphur, selenium or tellurium).